← Hoard of the Dragon Queen: reviewed! Having weathered the assault of the Cult of the Dragon the party are tasked with tracking the raiders to their camp and infiltrating it. In fact, they are asked twice by separate bodies with similar goals. The characters motivations aside from ‘being goodies’ are unclear, so I’d recommend strengthening bonds here. Tracking the baddies is easy enough and there are stragglers and rearguard to deal with along the way. The obvious solution to the breaking into the camp problem is to steal uniforms but that could back fire. The camp itself is sketched out in the description, and you’ll have to read all of it to get your head round the layout. Again, the provided map look nice but is no actual use to DM or players. Interesting to see, the named NPCs from the previous episode get portraits here. Better late than never I guess. There’s a specific NPC to rescue in this episode, and he will need working up properly by the DM. You get no stats, or much more in the personality stakes. He appears to be reluctant to leave, and I wonder how best to play him so that a party won’t just get irritated and walk away. Sympathetic NPCs are a must to any plot driven scenario, and this fellow looks like he might be around for the long haul. This is less of a combat scenario, and more of an info gathering behind enemy lines affair. As such, I’d have preferred there to be more mini events provided to spur interaction. I’d rather that, than the boilerplate skill DCs for climbing and stealth. To be honest, these things annoy me a little. Skill DCs are 10/15/20 for easy/medium/hard. There you are, I’ve memorised them from the rules. Why are these getting book space again and again when the NPCs and creatures are getting nothing extra beyond their name in bold? 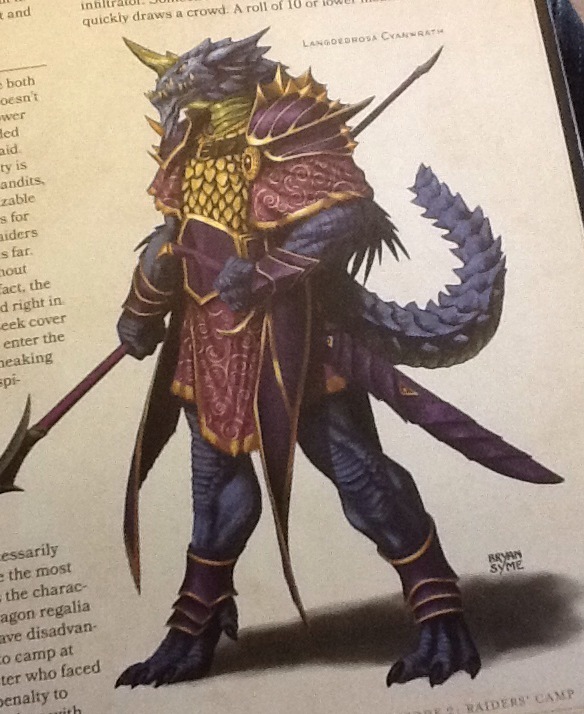 The adventure assumes you have the Monster Manual, yet repeats basic stuff from the PHB. What I need from an adventure is to first of all DM me through the game so that I can be the middle man and then DM it to my group. The book has to paint me a clear picture first. Then, it has to be useful in play. What I’m getting from the first two episodes are sketches, that really needed stronger development to make them rock solid. The omissions are startling (who are the leaders? I see names already, but I know nothing more) and all the more so when you know that it’s standard practice to provide an adventure overview these days. There’s one here, but it’s at too high a level to help me navigate the plot. Given that the possibility of interrogating hostile is so very high, that’s a bad editing choice. Harking back to 4e, an edition let’s not forget with a poor reputation for it’s adventure material, at least it laid out its encounters in a handy at-a-glance format. You could read ahead three pages and get enough to run a session. This one needs study, and notes, and yes, imagination. Not a bad thing in and of itself, but it’s a steep ask of a time pressured DM who bought this perhaps hoping all that would be taken care of. The plot is thickening, but my tolerance for the lack of DM assistance is thinning.